Fall and winter weather create challenges for calves. Keeping them healthy and growing can be difficult. 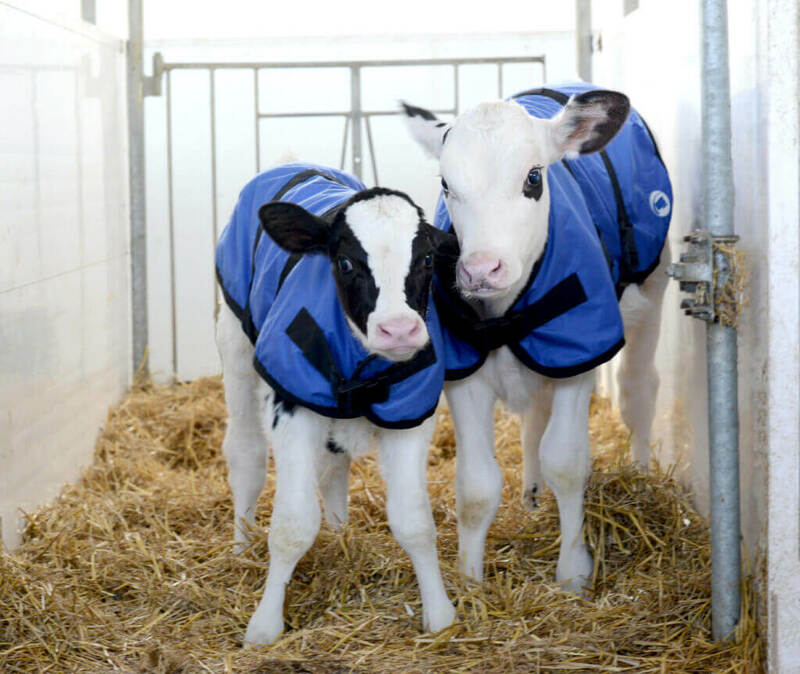 Simple management strategies like using a calf coat help keep calves warm, dry, and comfortable in your barn or hutches. But great is not always easy. On-farm challenges like environmental, nutritional, social, management and housing all shape how a calf will perform and grow. Some challenges are within your control and some are not. Calf coats are an easy win. Our coats naturally generate heat by reflecting body heat back to the calf, to keep them within the ideal thermal-neutral zone. The material is easy to wipe clean of dirt, holds no odour and is machine wash friendly. Wash in cold water and hang to dry for best results. Our calf coat features a front buckle around the neck with an adjustable strap, adjustable side/under buckles and two adjustable elastic leg straps to help keep the coat in place when lying down. Two sizes are available – small and large, dimensions of each below. FIR-FLEECE is an advanced technology designed to bond to fibres of material and reflect body heat as FAR infrared energy. This technology provides safe thermal energy to help calves stay warm and keep subcutaneous tissue and joints warm, while increasing circulation. Warm muscles and joints reduce the risk of injury and keep calves mobile. Offers excellent moisture wicking properties, this material retains less than 1% moisture. Want to order a calf coat asap? Need info on pricing? We got you. Keep your calves warm and give us a call today. Our order desk is happy to get you started and get your coats delivered. Just give us a call.